You know what this is, but I'll tell you anyway. It's a post celebrating some suicide ganks conducted by the New Order during the week of May 5th @ 00:00 EVEtime through May 11th @ 23:59 EVEtime. It's hard to go wrong starting with an Orca gank. Die Venus spurned the safety of a 10 million isk mining permit in favor of the supposed protection of Concord in a 0.7 system. So much for that plan. Agents Guybertini, Sara Arran, John E Normus, xxBLACK SKULLxx 929, Dr Tyler, Apollo von Sol, xXBlackShinigamiXx 777, Diabolical Fullmoon Mysticism, xX1337xHonyzXx, Ailish Liu, and Rollo Tomasi Stetille taught her an important lesson. The Orca contained a Mackinaw, which was preemptively destroyed. Bonus! Agent enterprisePSI was on hand to record the gank, and uploaded this fine YouTube video for your enjoyment and education. For some reason, Shaplitu thought it would be a good idea to fly a 169 million isk Retriever. 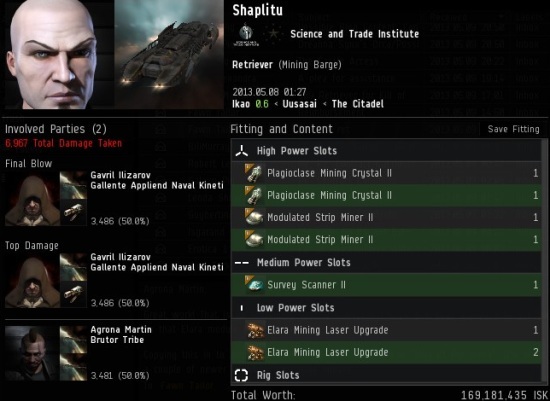 Agents Gavril Ilizarov and Agrona Martin executed him for his crimes and recovered two out of the three valuable mining upgrades that dropped. If you're going to spend 169 million on a mining ship, you may as well upgrade to a Mackinaw. Or better yet, upgrade to a Code-compliant vessel of any classification. 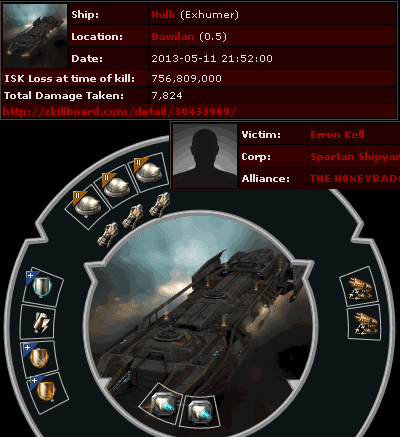 The only thing sillier than a 169 million isk Retriever is a 756 million isk Hulk. Erron Kell made the conscious decision to fit his ship with a bunch of expensive shield mods and named mining upgrades. Disastrously, he left his permit slot empty. You know, a little humility goes a long way. Adorning one's self with flashy mods is very immodest. Agents xxBLACK SKULLxx 929, Guybertini, Dr Tyler, Apollo von Sol, Lenda Shinhwa, xXBlackShinigamiXx 777, and Sara Arran arrived and showed him the error of his ways. 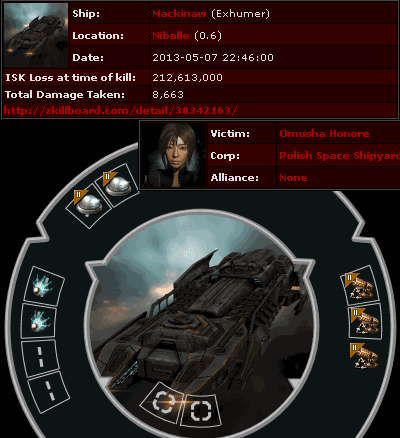 Omusha Honore proved that you don't need a lot of isk to set yourself up for an interesting lossmail. Omusha did it on the cheap, fitting his Mackinaw with two tech I webifiers. Why did he do it? Agents Ziaeon and Capt Starfox killed him before he had the chance to explain, so it must remain a mystery. Omusha Honores fit was probably optimized for "web tanking", using another similarly exhumer to stay aligned while mining at a very low speed. Its a common strategy used in WH space and elsewhere. Oooooo... That's actually intelligent. I'm impressed. I notice that the ship has more mid slot items fitted than it has midslots. 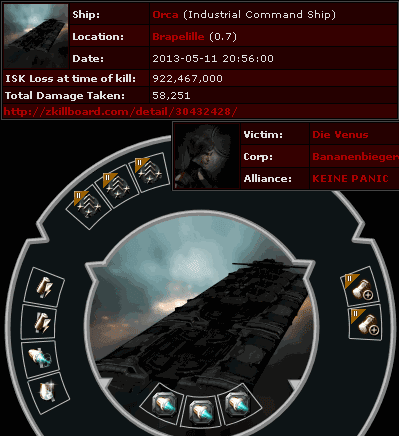 Which means this ship has been running that setup since before CCP removed the third mid slot. Talk about not paying attention. Also I thought that, when CCP removes a slot, ships with items fitted in that slot are not allowed to undock until they remove the excess module. If true, this would mean this ship hasn't docked in ages. Which sounds more like a bot than a bot aspirant. You mean that Mack kill with the webs? Mackinaw has three lowslots. It /gained/ one in Inferno 1.2. Eve-kill doesn't update the slot pictures. It's a Mackinaw (4 midslots), as opposed to a Retriever (1 midslot). My first Orca. Die Venus lived up to his name.